Carrie Fisher was a brilliant writer, an amazing actress, and, by most accounts, just a good human being. She passed away yesterday and I, like many people, took to social media to mourn the loss of this incredible pop culture icon. But I unknowingly helped spread a meme that turns out to be fake. Did you see that script with handwritten edits for The Empire Strikes Back? Those edits weren’t made by Carrie Fisher. 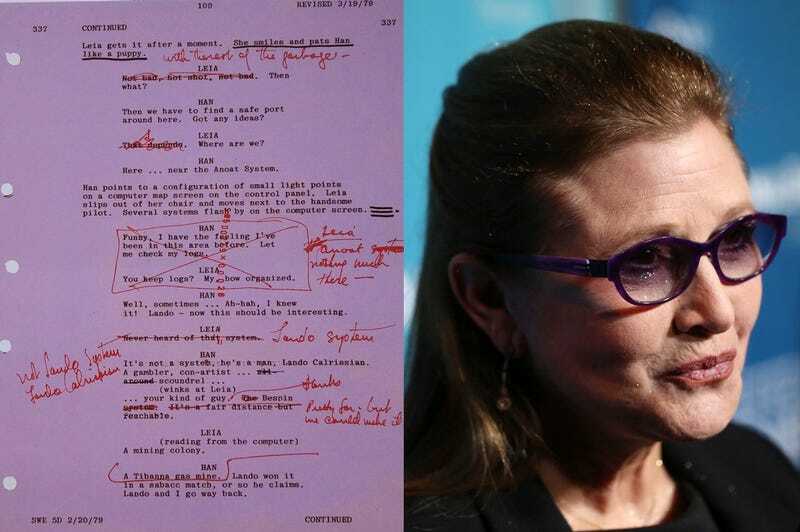 Carrie Fisher was a legend at fixing scripts. An Entertainment Weekly article from 1992 called her “one of the most sought after [script] doctors in town.” She helped fix up everything from Hook in 1991 to The Wedding Singer in 1998, and plenty of others along the way. But that particular page from The Empire Strikes Back, which recently went viral, isn’t from Fisher. The script page was published in the book The Making of Star Wars: The Empire Strikes Back, but the caption doesn’t mention Fisher at all. The notes were actually made by director Irvin Kershner. Fixing up scripts paid well for Fisher, as those in Hollywood know, but she didn’t receive any credit for the work—which is pretty typical. Comedian Patton Oswalt has an entertaining stand-up bit about doing “punch ups” for scripts where you don’t get credit, but you get an awful lot of money. It sounds like Fisher did pretty well for herself doing that in the 1990s in between acting gigs. So, no, Carrie Fisher didn’t edit this particular script. In fact, during a 2008 interview Fisher said that she didn’t rewrite any dialogue on the Star Wars films until Return of the Jedi. But that doesn’t diminish all of her other important work. Sadly, this particular piece of viral content had its heart in the right place, but it’s totally fake.